Some players prefer to use a pick rather than their fingers to produce a note. Because the strings on a bass guitar are much heavier than those on a guitar, your bass pick needs to be heavier as well. Hold your pick between your index finger and thumb. Make a light fist and rest your thumb on top of your index finger. Slide your index finger along the bottom of your thumb until it reaches the first knuckle of your thumb. This is where the pick goes, with only the tip of it showing. You also can try playing with an open hand. 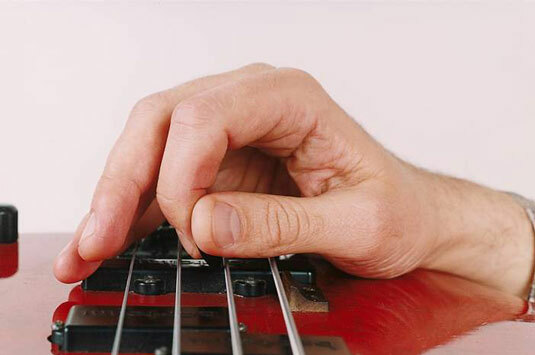 The pick still goes between your thumb and index finger, but you leave a space between your fingers and your palm, and you rest your ring finger and pinkie against the body of the bass. You may like the increased control you get from using this method. Both styles require you to make a twisting wrist movement with your picking hand. With a pick, you can strike the string from either above or below. Some players prefer only downstrokes; others use only upstrokes. Still other players combine the two for an even faster technique. Feel free to experiment and find out which technique suits your musical style. Pick playing isn’t an aural (acoustic) necessity anymore. 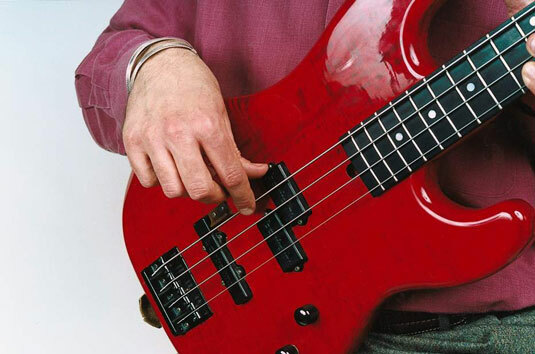 Technology has caught up, so don’t worry, your bass will be heard equally well without a pick. However, in the age of music videos, pick playing is preferred for its visual impact. 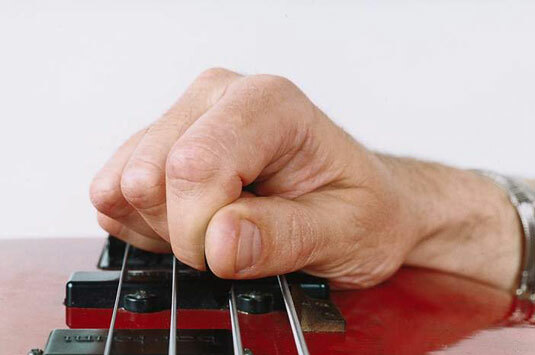 You can really see the bass player working when he or she is using a pick.